Begin by preheating oven to 375F. 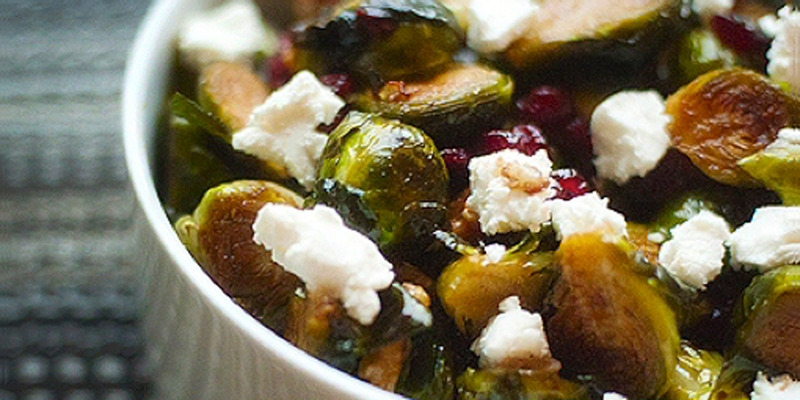 Start cleaning and cutting the Brussels Sprouts in half. Combine with oil, garlic and seasonings in a bowl. On a baking sheet, spread sprouts evenly across. Drizzle any remaining olive oil over the sprouts. In a small saucepan pour vinegar and sugar. Bring to boil over medium high heat. Bring down the Heat to simmer until thickened, about 3-4 minutes. Make sure to keep an eye on it. (you can toast some with cinnamon and sugar in the oven, also). Place in serving dish. Add crumbled goat cheese on top. Serve immediately.